This image has captured at least four Martian avalanches, or debris falls, in action. It was taken on February 19, 2008, by the High Resolution Imaging Science Experiment (HiRISE) camera on NASA's Mars Reconnaissance Orbiter. 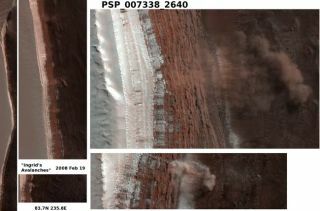 A NASAspacecraft has taken the first-ever image of an avalanche in action near Mars'north pole. The HighResolution Imaging Experiment (HiRISE) on NASA's Mars Reconnaissance Orbitertook the photograph Feb. 19. The image, released today, shows tan clouds billowing away from thefoot of a towering slope, where ice and dust have just cascaded down. The camerawas tracking seasonal changes on Marswhen it inadvertently caught the avalanche on film. HiRISEmission scientist Ingrid Daubar Spitale of the University of Arizona was the first person to notice the avalanche when sifting through images. "Itreally surprised me," she said. "It's great to see something sodynamic on Mars. A lot of what we see there hasn't changed for millions ofyears." The fullimage reveals features as small as a desk in a strip of terrain 3.7 miles (6kilometers) wide and more than 10 times that long, at 84 degrees northlatitude. Reddish layers known to be rich in water ice make up the face of asteep slope more than 2,300 feet (700 meters) tall, running the length of theimage. Thescientists suspect that moreice than dust probably makes up the material that fell from the upperportion of the scarp. "Ifblocks of ice broke loose and fell, we expect the water in them will bechanging from solid to gas," said Patrick Russell of the University ofBerne, Switzerland, a HiRISE team collaborator. "We'll be watching to seeif blocks and other debris shrink in size. What we learn could give us a betterunderstanding of one part of the water cycle on Mars." What setoff the landslide and whether such events are common on Mars is something elsethe team will be looking at. "Wedon't know what set off these landslides," Russell said. "We plan totake more images of the site through the changing Martian seasons to see ifthis kind of avalanche happens all year or is restricted to early spring."